We're fine with getting dressed to the nines and bringing Sparky with us to the ball, but would it be too much to ask to have a doggie afterparty at Barker Field? Maybe some glow-stick-style collars? This annual fundraiser for the Richmond Society for the Prevention of Cruelty to Animals won't judge you if your date has whiskers. This evening benefits an organization that pays for the care and rehabilitation of sick, injured and homeless animals. 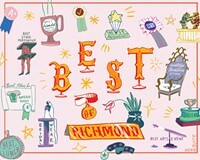 The Richmond Heart Ball in April, an ever-changing, extravagantly produced but not stuffy event, raises big bucks — $708,000 at its event last month — to fight heart disease and stroke. It's followed by the Pink Tie Gala, which is a Victorian masquerade ball this year, scheduled for Oct. 25. Note to self: Get tickets now.